The Virgin Suicides | Soundtrack Review Album reviews. Air, the eclectic French duo who brought us the critically acclaimed Moon Safari in 1998, has returned. And, once again, they have broken away from standards, walking their own musical path. This time they have composed, produced, and performed the score to Sofia Coppola's directing debut, The Virgin Suicides. This is their first new work since Moon Safari. The new music shows a different side of these boys. The glossy synth-pop samples that made Moon Safari have taken a backseat to a more minimalist style. There is nothing fanciful here, instead they have achieved a sense of traumatic beauty previously found only with classical composers such as Debussy. The album opens with "Playground Love" and is the only song with vocals. It is sung by Gordon Tracks, another French musician, and sets the depressing tone of lost love. This depressed theme continues throughout the album, especially on songs such as "Bathroom Girl" and "Dark Messages." As the songs go on throughout the album, we hear reoccurrences of themes - both musical and emotional. "Highschool Lover" is a refrain of "Playground Love" but without the vocals. It is also listed as "Theme from The Virgin Suicides" and its longing tone sets the musical mood for this film. Other pieces such as "The Word 'Hurricane'" and "Dead Bodies" return Air to a state more reminiscent of the work we heard on Moon Safari. "Hurricane" begins with a more up-tempo feel, with vocal chanting mixed in. However, the music and chanting cuts back midway through, and a female voice enters, offering a definition of a hurricane. The music comes back in, swirls around, and becomes much more avant-garde, incorporating bursts of piano, twisting around until it all dies out. 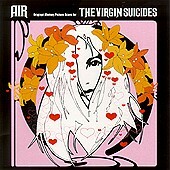 Air has succeeded in making a beautiful, yet somehow disturbing piece of art to accompany The Virgin Suicides. One cannot help but become entranced by the genius these two men possess. If the film is anywhere near as mystifying as its score, it will be one of the great films of the year. If the score becomes more than accompanying music, and instead becomes a part of the film, the film will be more than a movie, it will be a work of art. Godin and Dunckel have done their part. Now it is time to see if Coppola can do hers.